With Colombia putting in a convincing display earlier on in the day, both teams would be nervously eyeing one another up going into their first game of a highly competitive group. The teams lined up broadly the same formation. 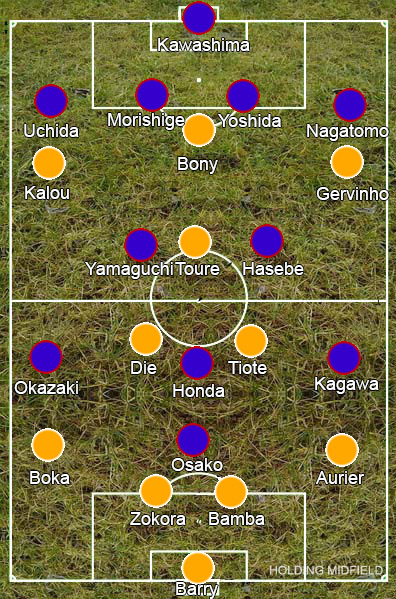 Japan in a 4-2-3-1 and Ivory Coast in a 4-2-1-3, with Yaya Toure deeper off the ball than Keisuke Honda and both sets of full-backs looking to bomb forward. Some neat interplay and dribbling between the strikers meant it was Ivory Coast who made the stronger start but some fantastic play by Honda put Japan into the lead. Organised well, they then sat back and soaked up the Ivory Coast pressure, breaking quickly. The Ivorians worked the ball forward quite well but their brightest sparks came from Wilfried Bony coming deep to open up space for Gervinho to catch people out on the counter, which would have worked better had they taken the lead. While entertaining, the game had little tactical interest until Didier Drogba was brought on and Ivory Coast went 4-4-2. Two crosses from Serge Aurier later, they had the lead. The added presence in the box allowed them to exploit the Japanese defence’s weakness in the air and claim an important victory in Group C.